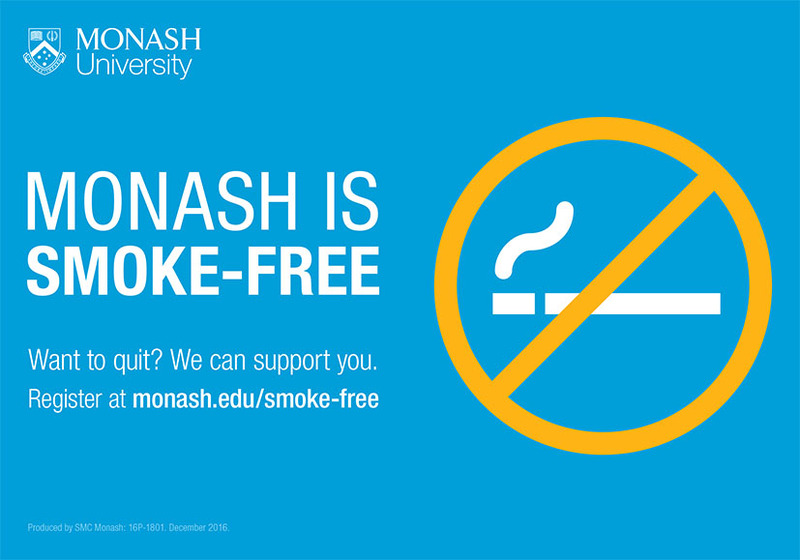 Monash supports a healthy smoke-free environment with smoking no longer permitted on any Monash Victorian campus, including University buildings, grounds and vehicles. This rule applies to all students, staff, contractors and visitors at Monash. Refer to the Wellbeing and Support Procedure - Smoke-FreeCampus. To support those who wish to quit, there are a range of programs and services available through University Health Service, and Counselling. Resources are available on the Quit website on services best for your quit journey. If you would like direct support you can contact the Quitline on 13 78 48. Monash is supporting the health of our students, staff, contractors and visitors. There is clear evidence to show that smoke-free environments increase the rate of quitting and reduce the amount of people taking up smoking. This is part of a broader commitment by all Victorian universities to provide healthier smoke-free environments. Smoking of any material or use of e-cigarettes or similar devices is prohibited on all Australian campuses of Monash University. Where can I go if I want to smoke? If you wish to smoke, you will need to go off-campus. Although there is a ban on smoking on campus, Monash recognizes the unique living arrangements of our residential students. A limited number of smoking points remain around residential accommodation for their use only. What should I do if I see someone smoking on campus? Transitioning to a smoke-free campus requires respect for others – both non-smokers and smokers. You are encouraged to respectfully and politely remind smokers that they must go off-campus if they wish to smoke. Security staff will undertake regular patrols of each campus. Where an individual is found on campus to be smoking as defined above, they will be asked to cease smoking and will be advised of the requirement to comply with this procedure. For staff, students and contractors, failure to comply with this procedure may result in disciplinary action. Authorised by: Chief Marketing Officer, Strategic Marketing and Communications. Maintained by: OH&S WebmasterTeam. Last updated: Feb 2019.